The Moose Riders are consistently among the fastest growing and most “active” of all Moose Lodge Activity Groups. The earliest evidence of Moose-related motorcycle groups is a motorcycle patch found from a group affiliated with the Greater Chicago 3 Moose Lodge, which ceased operations in 1992. 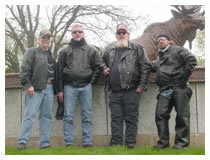 The "Moose Rider" group's origins and first use of the name goes back to the Lafferty, OH Lodge 1462 between 1994 and 1996, when several Lodge motorcycle enthusiasts became known as “the Moose riders”. 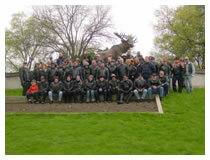 The first official Moose Rider group meeting was held on April 1st of 1996. The Ohio Moose Association Moose Riders held their first “Bike-A-Rama” on August 24, 1996. When David Chambers became General Governor in 1996 the Ohio Moose Association Moose Riders were already established. He subsequently had numerous conversations with them regarding their program and created a set of operational guides (originally known as by-laws) for them and used these as a model for the rest of the fraternity. When Steve Greene became the General Governor, he adapted the available materials into the Guidelines that are currently in use and enforced.